In the Ramayana, most of us think of the epic as ending after the reunion of Rama with his sons and Sita's descent into Mother Earth. We don't often ask or care to know how did Rama and Laxman die - both were after all human. Similarly, for most of us, the Mahabharata had for all practical purposes ended with the defeat of the Kauravas on the plains of Kurukshetra, and with Yudhishthira crowned the rightful king. What after that? Sure, Parikshit was crowned king when Yudhishthira ascended heaven in his human form. We also know of the faithful dog who accompanied him along the way. But there are several details that are often glossed over in most retellings. 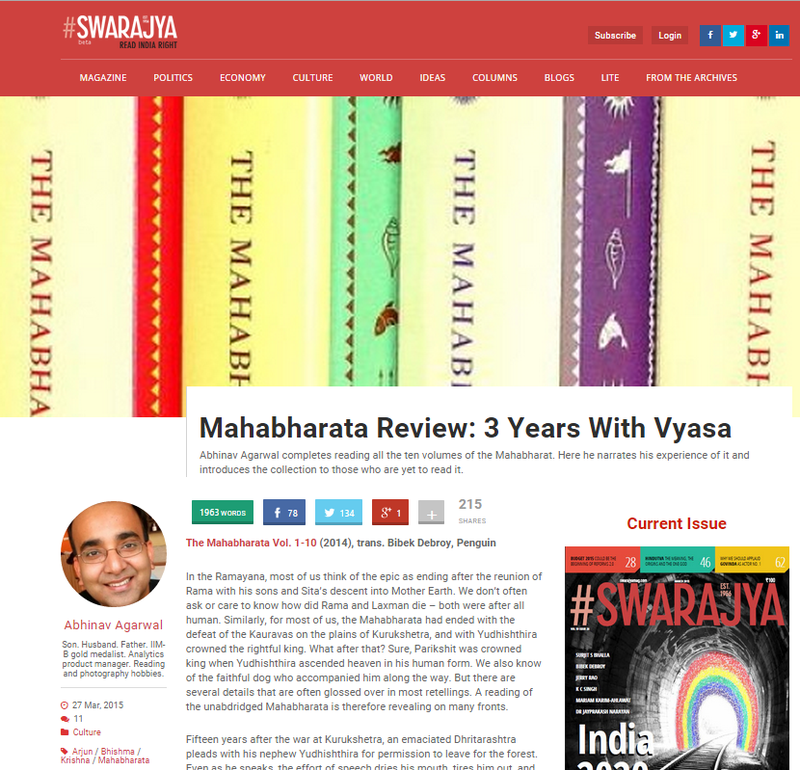 A reading of the unabdridged Mahabharata is therefore revealing on many fronts. Fifteen years after the war at Kurukshetra, an emaciated Dhritarashtra pleads with his nephew Yudhishthira for permission to leave for the forest. Even as he speaks, the effort of speech dries his mouth, tires him out, and he has to lean on Gandhari for support. A shattered Yudhishthira in turn pleads with Dhritarashtra, and when Vyasa advises the king to grant his son permission to leave, all that Kounteya can do is to stand in front of his uncle and request him to eat something before leaving. To perform even a funeral ceremony for the departed, including his sons, Bhishma, Drona, Bahlika, Somadatta, and others, Dhritarashtra has to turn to Yudhishthira. A year later Vidura, who by now "consists only of veins", dies; he wanders alone in the forest, naked, "covered in filth and smeared with pollen from wild flowers". He will be buried, not cremated. Two years after that, a great fire engulfs the hermitage where Dhritarashtra, Gandhari, Kunti, and Sanjaya live. Dhritarashtra, Gandhari, and Kunti are too weak to move to safety. Sanjaya departs for the Himalayas, never to be seen again. Fast forward to thirty-six years after the war. An insolent Sambha - son of Krishna and Jambavati - tries to belittle the sages Vishvamitra, Kanva, and Narada, only to be cursed by the furious sages. In a desperate bid to avoid the unavoidable, the drinking of liquor is banned in the "houses of the Vrishnis and the Andhakas", the penalty for infraction is deemed for the violator to be "impaled alive on a stake" along with his relatives. Even as the Vrishnis and Daruka look on, Krishna's Chakra disappears into the sky and his horses drag his chariot into the ocean. Varuna has started to claim what was originally his. He will claim much more over the coming days. The Yadavas proceed to Prabhasa, taking along with them copious quantities of liquor, to which they are addicted. Drunk, they start to argue. Yuyudhana and Pradyumna insult Kritavarma. Satyaki argues. Pradyumna enters the fracas. The fight starts in earnest. Clumps of eraka grass turn into clubs as "firm as the vajra." The sages' curse is coming true. Five hundred thousand Bhojas, Andhakas and Vrishinis end up killing each other. Gandhari's curse, that lay dormant for thirty six years, had woken up, as ordained. Arjuna arrives, searches out the bodies of Rama (Balarama) and Vasudeva (Krishna) and has them cremated. The ocean floods Dvaraka. The city had been claimed from the ocean. To Varuna it has returned. Bandits attack the convoy of the Vrishni women. Arjuna can string the Gandiva only after exerting a great deal of effort. He tries to think of his weapons, but cannot. Divine weapons no longer manifest themselves. His quivers of arrows are soon exhausted. They reach Hastinapura, where Satyabhama and other queens leave for the forest. Vyasa tells the Pandavas - "Know that the time for your departure has arrived. ... Time is the root of everything. It is the seed of the universe. As it wishes, time also draws everything back again." The Pandavas extinguish the sacrificial fire that has burned in their houses - marking the end of their lives as householders. Parikshit, Arjuna's grandson, is instated king of Hastinapura, with Yuyutsu to supervise the new Pandava king. The last of the Yadavas, Vajra (Pradyumna's son), is made king of Indraprastha. Arjuna discards his Gandiva and two quivers into the ocean, returned to Varuna. All this and much more is described in the tenth volume of Dr. Bibek Debroy's unabridged translation of the Mahabharata. It thus concludes the mammoth effort that began in 2010 with the publication of the first volume. This volume concludes the Moksha Dharma Parva, and with it the massive Anushasan Parva. It also contains Parvas fourteen through eighteen - Ashvamedhika, Ashramavasika (which in turn contains Ashrama-vasa, Putra Darshana, and Naradagamana Parvas), Mousala, Mahaprasthanika, and Svargarohana. As has been a constant in all ten volumes, this one also is dotted with footnotes, numbering close to two thousand in the final volume. Of these, a thousand or so are for Vishnu Sahasranaam - a recitation of the thousand names of Vishnu, found in chapter 135 of Anushasan Parva. These footnotes are of immense help even to the casual reader, helping clear matters minor and major. Anugita - a continuation of Krishna's sermon to Arjuna can also be found in this tenth volume, in the Ashvamedhika Parva. As can countless other stories and discourses of attaining salvation, most of which are to be found in the Moksha Dharma Parva. Among English translations of the Mahabharata based on the Critical Edition (the Critical Edition of the Mahabharata was published by Pune's Bhandarkar Oriental Research Institute over a period spanning nearly fifty years, and since its completion over four decades ago, has been the basis for many scholarly derivations and translations), Dr. Debroy's work is not only the latest, but as far as I can tell, the only completed complete translation. The University of Chicago's series started in 1973, but is still not complete - the last volume came out in 2004. The Clay Sanskrit Library's Mahabharata is based on the Nilkantha recension. P. Lal's of the Writer's Workshop is a poetic transcreation, and not, strictly speaking, a translation. Ramesh Menon's is based on Ganguly's Calcutta Edition from a century ago. All others are either retellings (Devdutt Pattanaik's "Jaya" for example), creative adaptations (Chitra Banerjee Divakaruni's "Palace of Illusions" for example), or abridged translations (as in John Smith's). How do you then read the complete Mahabharata? The too-clever-by-half answer would be, "one shloka at a time, one page at a time." When the epic in question stretches to close to eighty thousand shlokas (verses) - less if you exclude the Hari Vamsha, which though part of the Mahabharata is still considered a "kheel", an appendix - and six thousand pages, one at a time can take time. In my case, it took a little over three years. I started reading Volume 1 of Dr. Bibek Debroy's unabridged translation on the Sixth of February, 2012. Three years and not quite one month later, sometime shortly after midnight on the third of March, 2015, I finished the last chapter and verse of the epic. The tenth volume of Dr. Debroy's translation was done and dusted. All the principal characters that took part in the great war on the fields of Kurukshetra had finally gone to heaven, and Yudhishthira was now at peace with himself. If you plan on reading Dr. Debroy's ten-volume unabridged translation, you may find it useful to use the accompanying graphic to navigate your way through the the ninety-five parvas and eighteen major parvas and how they span across these ten volumes. A couple of notes though to help clarify are in order. First, the horizontal bars represent the number of shlokas in each parva. Therefore, you can tell that while Anukramanika is 210 shlokas long, Sambhava parva is a gigantic 2,394 shlokas long. Second, the color coding corresponds to what is covered in each of the ten volumes. Therefore, you can see that the second volume, for example, begins with Arjuna-vanavasa parva, and ends with Indralokabhigamana parva. This neat compartmentalization however breaks down towards the end, when a little less than a thousand shlokas from Raja-dharma parva are covered in Volume 8, but the remainder in volume 9. Lastly, the thin strip of alternating gray bars that run to the right of the major Parva numbering represent the extent of each of the eighteen major parvas. Another interesting nugget about these volumes is that while all ten volumes have an almost identical layout and cover - the cover has no text on it; only a series of symbols associated with the epic and war - a sign of the sun, a flag, a fish, arrows, a lotus, swords, an elephant, and so on. Each volume has a different color - the first volume is a dark shade of red, while the tenth volume is jet black. Each volume features a different symbol on its spine. The first volume has an illustration of snakes tumbling into a fire. This is the imagery of the "sarpa-satra", or snake sacrifice in the Adi Parva that King Janmajeya organized to avenge his father's death at the hands of Takshaka. The second volume has a "chausar", the board for the game of dice, laid out, and a few dice strewn about. This occurs in the "Sabha Parva".Volume 3 has a couple of earrings and an armour plate on its spine. These two, of course, are the "kundala" and "kavacha" of Karna, that he was born wearing, and which made him invincible in battle. Volume 4 might be a little difficult. The spine feature a bunch of cows. This imagery is of the stealing of King Virata's cows by the Kauravas. The spine of the fifth volume needs no introduction. It is Arjuna's chariot, with Krishna as the charioteer. Arjuna is standing with the bow in his right hand, meant to emphasize Arjuna's ambidexterity ("savyasachi" is one of Arjuna's names). It is also the only volume to feature a person - and two at that, on the spine. The sixth volume has a spiral - the famous chakra vyuha formation. The chakra vyuha was the formation that Drona, the Kaurava commander, put in place on the fateful thirteenth day of the war. The seventh volume marked the end of the Mahabharata war, with Karna killed on the seventeenth day on the battlefield of Kurukshetra, beheaded by an arrow shot by Arjuna at an unarmed Karna who had got down from his chariot to extricate its wheel that had been mired in mud. Hence the spine of the seventh volume has an illustration of a wheel partially submerged in mud. The eighth and ninth volumes have identical symbols - a series of arrows. These symbolize Bhishma's deathbed, and the fact that these two volumes, and more than half of the tenth volume, cover the Shanti and Anushasan Parvas. The tenth volume has Sarama - the dog that accompanied the Pandavas on their journey heavenwards. The covers have been designed by Nitesh Mohanty, with Dr. Debroy's inputs. What next? Well, the appendix of the Mahabharata - Hari Vamsha - is still to be done. There are also stories from the Mahabharata that are not part of the Critical Edition, but still fairly popular. For example, the origins of the penning of the epic itself are divine, with Ved Vyasa getting Lord Ganesha to agree to being the scribe. This inexplicably does not find a mention in the Critical Edition. The tale of Amba and Shikhandi in the Critical Edition is quite different from that found in other retellings. That Duryodhana's body had been turned indestructible, with the exception of his hips, because of Gandhari, is also missing in the Critical Edition. One wishes that these stories are put together by Dr. Debroy. While you wait for Hari Vamsha - rumoured to be slated for release in 2016 - the ten volumes await you, the reader and student of the Mahabharata.